Prisoners of war. Colonel Manuel Rojas Garcia, centre, Captain Ramón Aguilar, right. It was October 28, 1987. 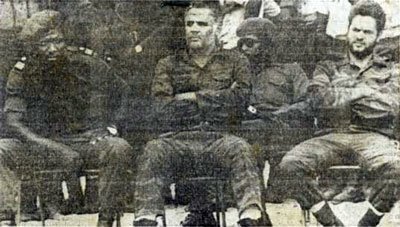 Cuban air force Colonel Manuel Rojas Garcia was flying his MIG over Angola’s Moxico province with Captain Aguilar next to him when they were shot down by UNITA. The two Cubans were captured alive and taken to Jamba, the UNITA headquarters cleverly camouflaged inside Cuando Cubango province… The Angola Field Group invites you to hear Colonel Garcia tell his story of life as a prisoner of UNITA and his perceptions of the war, Thursday, July 18, at 8:00 PM, at the Viking Club. The book he wrote about this episode of his life was published last year, ‘Prisioneiros da UNITA nas Terras do Fim do Mundo’ and is now in its second edition. He will be selling and autographing his book. Manuel Rojas Garcia joined the Revolutionary Armed Forces of Cuba in 1959 and learned to fly fighter planes in China and the Soviet Union. In 1971 he graduated in Political Science from Havana University and in 1976 he got his law degree. In 1982 he mastered in Military Sciences at the Moscow Academy of Aviation. In addition to Angola, he fought in Ethiopia in 1977. Presently he serves in the reserve unit of the Cuban Armed Forces. Everybody is welcome to attend the presentation which will be in Portuguese with simultaneous translation into English. In close cooperation with the Viking Club, this event is offered free of charge. Beverages and snacks are sold at the bar, coupons must be purchased. The Viking Bar opens at 7:30 PM. The Viking Club is on the main floor of the Edificio Maianga, Rua Marien N”Guabi, No 118 across from Panela da Barro, on the same side of the street as the Suite Hotel. For a map, click here.